It comes as polls indicate greater support for a referendum on a united Ireland in the north and south of the island. Britain's "Brexit" vote is forcing the issue, with a majority in Northern Ireland voted to remain in the EU, but the prospect of Britain withdrawling likely to cause the return of a "hard border" dividing the six northern counties Britain still claims from the 26 Irish counties that make up the southern state. 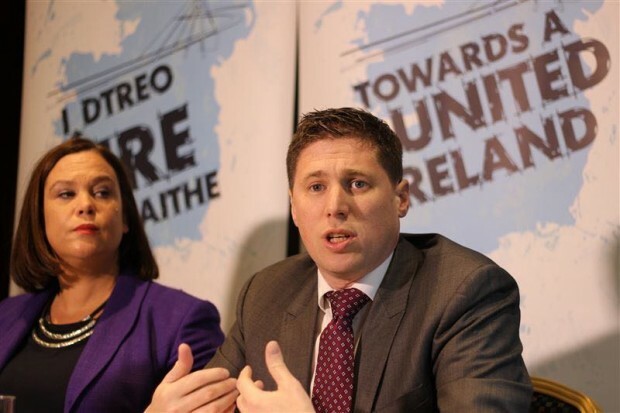 Below the video, Matt Carthy, a member of European Parliament for Irish republican party Sinn Fein, offers his views on the recent polls and the way forward to end partitian and create a democratic, socially just 32 county republic. I, as everyone in politics professes, don’t get excited by opinion polls. The insights emerging from this week’s Lucid Talk survey of public opinion in the North of Ireland were fascinating in a number of respects. The poll clearly confirmed that we are moving towards A United Ireland. Firstly, the poll shows a clear majority of people in the North now favour holding a referendum on a united Ireland. A majority also believe that 50% plus 1 should be the baseline for reunification, which is hardly surprising as this is a clear provision of the Good Friday Agreement. It is disappointing that the recent remarks from An Taoiseach resulted in this question even having to be asked. However, we should not have things so close to 50%. Advocates of a United Ireland should be committed to securing the largest possible majority for that proposition. The Lucid Talk poll also shows that we have work yet to do. All of us who favour a united Ireland, should work together with the common objective of convincing the greatest possible number of people across Ireland that it is in their best interest. The evidence is there that economically, politically and socially Irish unity is both the progressive and sensible option. We have to disseminate that evidence. And let us convince those who think otherwise that they have, nevertheless, nothing to fear from the outcome of a unity referendum. That is what Sinn Féin is seeking to do. It is clear also from the Lucid Talk poll that Brexit will continue to influence attitudes toward the constitutional question and will lead to increased support for Irish unity as the negative implications of Brexit become clearer. In short, Brexit has created an entirely new dynamic for the construction of a United Ireland and has accelerated the prospects of national unity. The illogicality of having one part of this island inside the EU and another outside it, is understood by almost everyone. After decades of lecturing republicans about ‘the principle of consent’ the refusal of the British Conservative Government to respect the expressed will of a majority of voters in the Six Counties is lost on nobody either. The prospect of the North being removed from the EU against the will of its people, and a possible return to border checkpoints and customs posts has brought the issue of Irish Unity firmly back onto the political agenda. Sinn Fein MEP Matt Carthy. Of course, the only poll that will matter is an actual referendum on the issue. But politics on this island, and arguably across the world, are now in flux. Increasingly people realise that it makes no sense to have two economies, two education systems, two health systems, two tax codes, two currencies on one small island. There is a growing recognition of the economic sense of an all-island economy with joined-up agriculture and health sectors, to name just two. This week’s poll is just the latest piece of evidence that the political landscape in the North is changing. More and more people from all walks of life now accept the need to look at the creation of new constitutional and political structures that better serve the interests of all our people. In this regard, by far the most telling aspect of the Lucid poll is the finding that a clear majority of voters under the age of 44 firmly support a united Ireland. This points to the direction of travel for the future and underlines the need for preparation to start now for a united Ireland. There is a clear and urgent need for an inclusive, constructive debate on the future and on what a United Ireland might look like. It is time now for the Irish Government to encourage and lead an informed, reasoned and respectful public dialogue on this issue. It is also time that the Government prepared a realistic plan for Irish reunification, including the establishment of an Oireachtas all-party group to bring forward a Green Paper for Irish reunification. Constitutional change is now in the hands of the people of Ireland, North and South. Now is the time for all parties who support Irish unity to come together to design the pathway to a new, agreed, inclusive united Ireland. Securing a referendum on Irish unity would be a momentous and historic opportunity for all the people of Ireland, allowing us to vote for the kind of country and society we wish to see. Sinn Féin has been seeking to promote constructive dialogue on the issue through a series of conferences and public engagements entitled Towards a United Ireland. This series will see us host conferences in Cork and London next spring. As with our previous events in Dublin and Belfast, we will seek to bring an array of opinions together so that we can build upon what we agree on as opposed to what divides us. Because we now have a unique opportunity to build a future beyond partition, sectarianism and division. It is a historic opportunity to build a society that serves the interests of all the people who share this island. We should seize it.